Sapienza University in collaboration with UNIMED invite interested university staff members to the Staff Training Week on “Integration of Refugees: the role of Universities” on April 16-20, 2018 at Sapienza University of Rome, Italy. 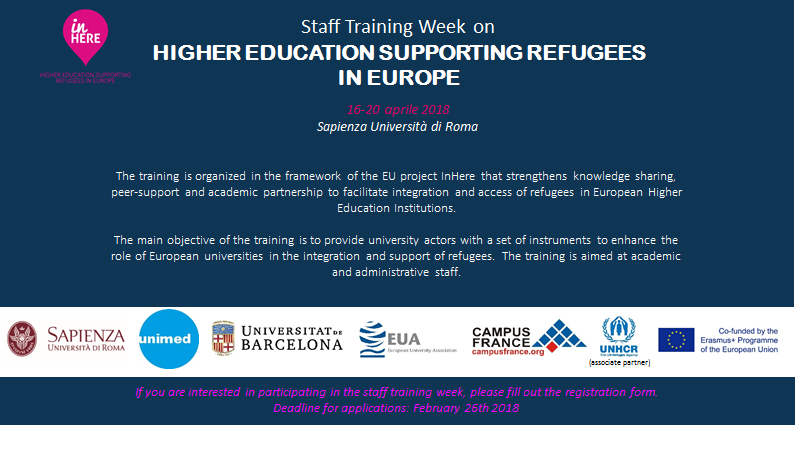 The training is organised in the framework of the EU project inHERE, aimed at strengthening knowledge sharing, peer-support and academic partnership to facilitate integration and access of refugees in European Higher Education Institutions. inHERE is implemented by a consortium composed by UNIMED (coordinator), Sapienza University,University of Barcelona, Campus France, EUA and UNHCR (associate partner). The main objective of the training is to provide university actors with a set of instruments to improve or initiate assistance activities for integrating refugees students within the university. The training is aimed at academic and administrative staff. If you are interested in participating to this staff training, please fill out the following form within February 26th, 2018. The training is organised in the framework of the Erasmus+ staff training week and it is free of charge. Since the number of participants is limited, there will be a selection process based on CV and Personal statement. The selection process will end by March 1st 2018. Results will be communicated by email. We look forward to receiving your application and welcoming you in Rome next April.